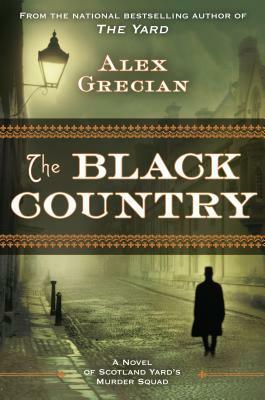 Book Two in The Murder Squad series by Alex Grecian, The Black Country is the sequel to The Yard which I reviewed for Cannonball Read 4. As a refresher the books are set in 1890 and focus on Inspector Day of Scotland Yard, a member of the newly founded Murder Squad. The Black Country picks up a few months later with Day, Sergeant Hammersmith, and Dr. Kingsley being summoned to Blackhampton in the Midlands where three members of a family are missing and the local constable fears they are dead after an eye is discovered in a tree. In The Yard I complained that there were perhaps one to many plots, one too many characters and one too many locations. It seems that Mr. Grecian heralded this critique and there are fewer dead bodies, fewer possible suspects, and only a handful of locations. While this may seem to be too much still to some readers, it was a much more crisply paced narrative than the previous outing, which also helped to keep reading this novel from feeling like a chore. There are two main plot lines to be concerned with, the missing Price family members and the mystery of Mr. Campbell and the pursuit of a character only known as ‘The American’ or Grey Eyes. Day and Hammersmith are focused on discovering the mystery of the Price family and are constantly foiled by townsfolk who are preoccupied by superstition and distrust of outsiders. I have seen complaints that this book is over plotted in comparison to The Yard and I’m wondering if they read the same two books I did. I think this second murder squad book is an improvement on the first, with the following complaints: 1 – Hammersmith doesn’t get to shine the same way he did in The Yard and both he and his fellow investigators do MUCH less scientific investigating than they did in the first and 2 – the timeline of Grey Eyes and Campbell is simply RIDICULOUS. That said, read these if you like historical mystery. I normally do pretty spoiler free reviews, but I cannot think of how to talk about my reactions to this book without spoiling the heck out of it, so if that’s a thing you want to avoid then you probably need to click right along to another review. Go ahead, I won’t judge. Promise. Anyway, now that we have that done, let’s talk about Tell the Wolves I’m Home. Our protagonist is June, age 14. She is telling us about the death of her Uncle Finn, her godfather and best friend. It is 1987 and the President of the United States won’t utter the word AIDS for a few more months but it’s the disease that took Finn from June and her family. June’s as up to date as it was possible to be 27 years ago, but the world at large isn’t. It’s a charged climate, and as much as that affects June, and how others react to her and Finn’s death, she’s busy processing the loss of the person she felt she knew entirely, and who knew her. The problem is that through machinations between her mom and her uncle, there is much about Finn’s life that June does not know, and it all comes screaming into her life with the arrival of Finn’s boyfriend Toby at the funeral. I wish the book had been told from Toby’s point of view. I want to read Toby’s story. I want to know about his childhood in England, I want more information about how he and Finn fell in love because what we are told feels like being short changed, how Toby dealt with his AIDS diagnosis when there was little to nothing to be done and AZT hadn’t been announced yet, what it felt like to get diagnosed with an illness that meant everyone would be terrified of being in physical proximity to you, how he coped with the decisions to accept being banned from Finn’s family’s life and subsequently let them believe he was the reason Finn had AIDS and not the other way around, and how he then attempts to survive losing the love of his life. But most importantly I want to know what it took from deep inside of him to attend Finn’s funeral and know that he would likely be turned away, at the very least, in an attempt to make a connection with the niece he was denied a relationship with and on whom his great love’s final wish rested. After a few fits and starts, June and Toby begin a clandestine friendship. What evolves is the type of relationship which they should have been allowed to have since Toby had spent the last decade with Finn – living in the same apartment that June visited – but she had no idea he even existed. Not his name, not his stories, she didn’t even know his belongings were his. She thought it was all Finn. This is a great story – the story of Finn orchestrating that his two loves are able to help each other process their loss after his death, even if they had been forcibly kept from each other during his life. But that isn’t really the story we get, although it is by far the best part of the book. What we do get is another coming of age story set against the backdrop of crisis. But it isn’t as good as others in the genre, such as The Age of Miracles. We spend a lot of (possibly wasted) time with June interacting with what death by AIDS means to the people who must now interact with the Elbus family following Finn’s death. And, how it relates to their individual interactions with the portrait. Greta is a 16 year old high school senior who is battling her demons about being pushed to grow up too fast, unreal expectations, the dissolution of her relationship with her sister, and feeling shunned from June’s relationship with Finn. Greta has taken to getting drunk at parties and roping her sister into attending them so that she can ‘rescue’ her in her inebriated state without telling June why. (This one was particularly bothersome to me, because I kept expecting to find out that the Drama teacher was abusing Greta in some way). Their mother, Danni, gave up her own dream of art after Finn left home to travel and study art on his own. Danni has an equivalent talent to her brother and seems to be holding on to a lot of anger about the life she could have had if Finn had stuck to ‘the plan’. Their dad is an accountant, like Danni, and they are so busy with tax Season as to leave June and Greta without supervision for the entirety of the spring. He is often also in the position of apologizing for Danni’s behavior. Brunt could have written a story about familial relationships and how they can disintegrate so easily without layering all these storylines over the plot. With that said, yes, the writing is good, the word choice is evocative and emotions are inspired, the characters are well drawn, but they can often be difficult to care about and their motives are vague if present at all. But this book still gets three stars because what Brunt does well is the sincere and the heartfelt and this book is teeming with it. I just wanted more. I have had a bit of luck with first time authors of late, and Hannah Kent is no exception. 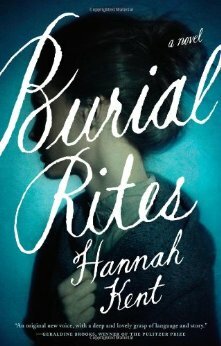 Her debut work, Burial Rites, is a gripping novel- all mood and emotion. It’s a story gaining speed like a stone rolling downhill, for there is only one way to go. Ms. Kent writes in Burial Rites about the last instance of capital punishment in Iceland. Its 1829, moving quickly into 1830, and everyone is waiting for word from Denmark allowing the beheading of Agnes Magnusdottir for her role in the murder of two men, one of whom was her employer. This is not a spoiler, as the entire book is built around Agnes’ death sentence, and her life between her trial and her execution. But I don’t really want to talk about plot in this review; I want to talk about language and intent. In her Acknowledgements Ms. Kent describes this work as her “dark love letter to Iceland”. She became acquainted with the story of Agnes Magnusdottir on a Rotary exchange trip to Iceland from her home in Australia, and researched the murders at Illugastadir to a magnificent depth, mining archival sources and academic writings to deliver a story based on the historical record. In fact, each chapter of Burial Rites begins with a primary source related to Agnes’ case, in a similar way to how Lyndsay Faye begins each of her Timothy Wilde books. What the reader receives is a story that is based in fact and embellished with fictional likelihoods which delivers, as Ms. Kent intends, a more ambiguous portrayal of Agnes and the people who interacted with her in the last few months of her life. The reader also discovers what life in northern Iceland was like nearly two hundred years ago through Ms. Kent’s evocative use of language. It is hard to believe that Ms. Kent is only 28 and this is her first novel. I am excited to see what else this author might bring to us moving forward. While I can’t seem to pinpoint where I heard about Burial Rites based on when I added it to my to-read list other reviews of Burial Rites include ElCicco’s from CBR6 and Miss Kate’s from CBR5.